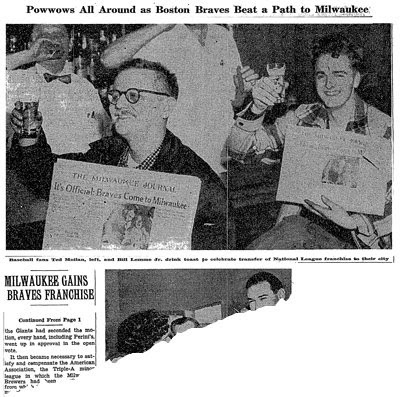 Ironically, the Brewers' success in the 1940s was responsible for the club's eventual departure from the Cream City. By making organized baseball aware of Milwaukee's devoted baseball culture, the Brewers put Milwaukee on the map as a possible relocation site for Major League teams struggling at the gate. Enter Milwaukee County Stadium. Built on the site of Story Quarry, close to freeways with more than enough room in all directions for both parking and expansion (not to mention tailgating), County Stadium was built specifically to lure a big-league club, and it worked. It is extremely likely that Milwaukee will get its much needed sports stadium at long last. Almost everyone agrees on the need of the stadium to house the Milwaukee Brewers. and the football Chiefs and Packers, other sports events and as the central point for drum corps and band competition at the national convention of the American Legion. Everyone knows about Lou Perini and the Milwaukee Braves. But before the Perini left Boston, another team had been looking at County with envy in its eye - the lowly Browns of St. Louis, owned by one Bill Veeck. Bill Veeck longed to move his Browns from St. Louis back to Milwaukee, where they had started as... the Brewers. Veeck knew and loved Milwaukee from his days as a Brewer owner during World War II, knew what kind of reception a big league club could expect and wanted to be at the head of that parade. 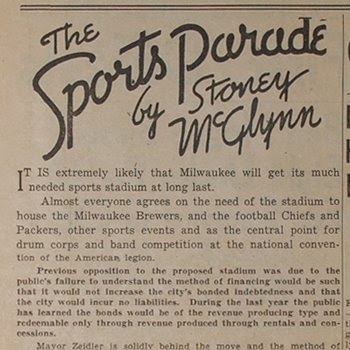 Ten years later, in May of 1951, a deal was reported near to bring the Browns to Milwaukee. The New York Times reported that Frederick C. Miller (of Miller Brewing) and Bill Veeck were set to buy the club, and that Fred Saigh, the owner of the Cardinals at the time, would buy Sportsman's Park from them as the exclusive and permanent home of the Redbirds. 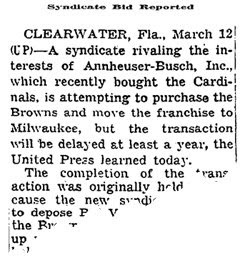 Although all partied involved were shocked, shocked to hear of such a deal, the St. Louis Post-Dispatch was reporting "a good possibility the Browns would be in Milwaukee before the 1952 season opens." Veeck would complete his purchase of the club (minus Fred Miller) in July of 1951, but wasn't able to put a relocation package together for the 52 season. And sure enough, that's exactly what Veeck tried to do. 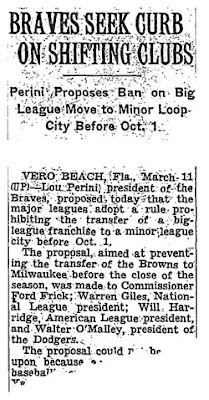 Never one to be constrained by the rules of baseball's Brahmin men, Veeck officially applied for permission to move the Browns back to Milwaukee for the 1953 season. The first stumbling block was thrown up by the Braves. The official reason given was that the Braves couldn't afford to lose such a valuable AAA franchise as the Brewers. Commissioner Ford Frick soon weighed in, claiming that "such a move is completely impractical at this late date". Veeck is not the only one to suggest that he himself was one of the reasons that organized baseball tried to put the brakes on his move. He was long distrusted by the baseball establishment for his carny-barker ways and unpolished manner. They saw him, no doubt, as a clown without the proper reverence for the sport. He saw them, in turn, as stuffy and humorless. 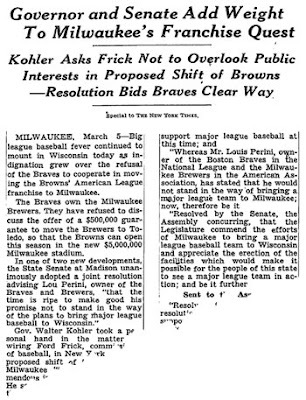 Regardless of the reason behind baseball's reluctance, Governor Walter Kohler responded strongly to it, and the Wisconsin State Senate asked both Frick and the Braves to get out of Milwaukee's way. Perini upped the ante the next week, proposing a major league rule that would prohibit "the transfer of a big-league franchise to a minor league city" before October 1st. Perhaps the Braves' move was inevitable. Perhaps Veeck forced Perini's hand, threatening to take away his fallback plan to staying in Boston. 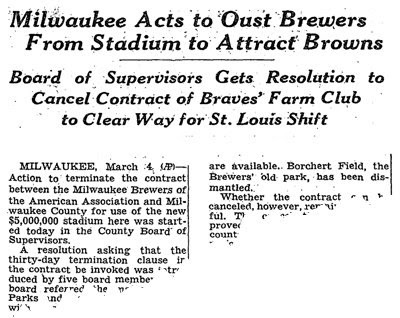 What is certain is that just two weeks after the Braves blocked Veeck's attempt to relocate to Milwaukee, at the same time promising not to "stand in the way of Milwaukee getting into the major leagues," they themselves announced their move to their AAA home. 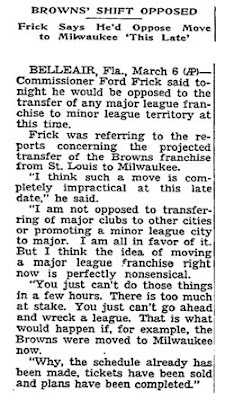 Frick's objections to a last-minute move vanished, and baseball approved the transfer, and Milwaukee raised a glass to its new big league club. 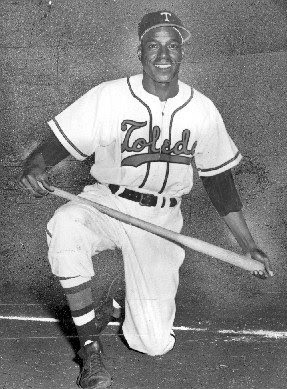 They stayed in Toledo for three seasons before transferring for two seasons to Wichita, Kansas (taking the parent club's "Braves" name), finally ending up in Ft. Worth Texas until the American Association folded in 1962, the final footnote to a proud chapter in baseball history. 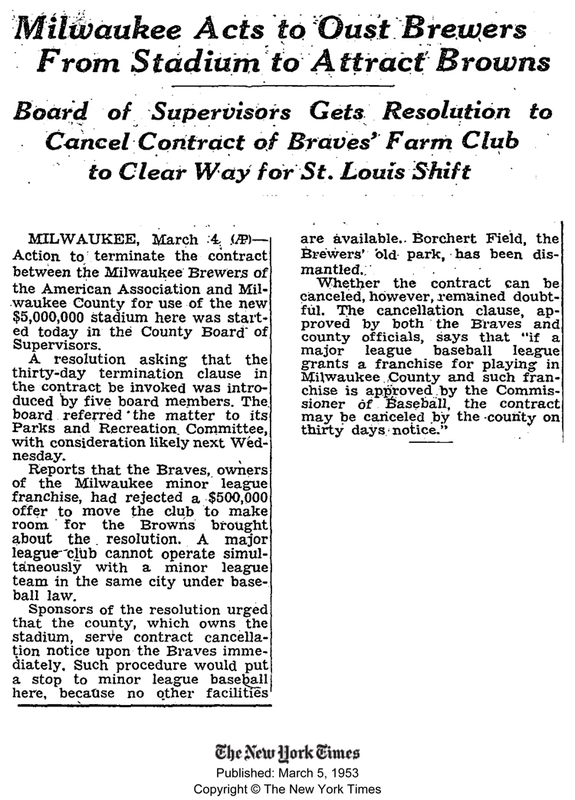 Although everyone knows the need of a sports stadium it is not generally known that with an up-to-date ballpark Milwaukee is a CINCH to take over the St. Louis Browns' American league franchise. I know the American league is willing to buy territorial rights to Milwaukee from the American association and that two Milwaukee capitalists are ready to purchase the Browns providing territorial rights are secured and a suitable park is available. 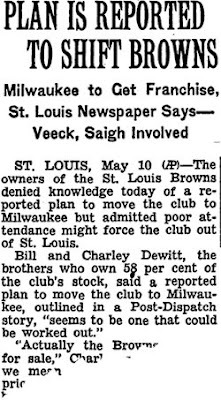 So a decade before Bill Veeck considered moving the Browns to Wisconsin (and years before he would even buy the Brewers), the Browns were rumored to be heading back to Milwaukee. We don't know what that would have been like. But had Veeck been the one to move the Browns back to Milwaukee, then the Cream City's baseball history would have been very different. 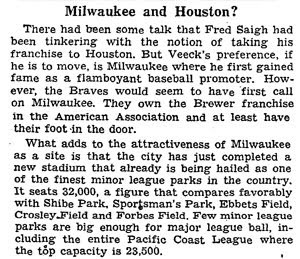 It seems likely that Veeck would have changed the name of the team back to "Brewers", given his history with the name. And with the combination of his promotional talents and Milwaukee's love of the game, there's no reason that a new American League Brewers, built directly on the foundation of the American Association club, couldn't have had a long and successful stay in the majors. And perhaps we wouldn't have to lobby the Brewers today to put Owgust on the sleeves.